It's hard, sometimes, not to feel my age. This is particularly true when the morning comes and I'm running late and I get half-way to the office and realize I don't have my meds with me. "I'll just take them when I get home," I think. More often than not, that doesn't happen. My inability to remember something so basic and so important can open the door to that little mocking voice we all have. "Boy are you OLD," it can say. "You can't remember something that important." And that's a spiral those of us who have existed with depression know all too well. That voice can be very, very hard to silence. When your health depends upon a regimen of pills and you forget them, the creaks and aches give that voice ammunition. With a vacation away from the familiarity of my kitchen, where bottles are neatly stacked in the order in which I usually take them, I felt a slight fear. I really did not want to pack all the bottles of things I take. While it's not a pharmacy, it's more than two. The more I thought about this, the more anxious I became about forgetting to take something in the excitement of the vacation. In a flash of enlightenment, I thought about a pill box. I put morning pills in the blue side and evening pills in the purple side. It worked like a charm. What day is it? Friday. Open that container. No bottles and the compartments snapped tight. I took everything when I had to take it and didn't forget anything. When I came home, I stuck this in the cupboard in the bathroom. It served its purpose and, it will travel with me whenever I go out of town, even if it's an overnight. No more lugging bottles. Lately, I've been struggling with the winter blahs. It's manifested itself in forgetting to take my meds. I get up late and the dash out the door to get to work on time causes me to skip doses. Then I get down on myself. At the end of last month, I remembered this. There were conversations with myself. 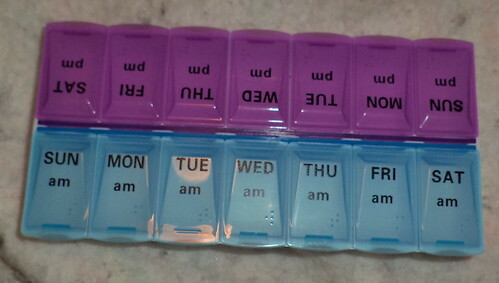 I'm getting old if I admit that I can't remember to take my meds. That nagging voice started to overrule the gentle voice that reminded me why I take this stuff. But I went 4 days without taking my meds and I started to feel it. I need help to remind me. Out came the pill box. So, for the last 2 weeks, I've carefully dropped the morning's pills into the blue side. I don't have much trouble with evening pills. They are taken on an "as needed" basis and I keep the bottles by the computer, where I tend to wind up at some point at the end of a day. I have the computer set up to send me an alert, too, when it's time to take the evening pills. The big issue is the morning doses. I pop open the top, put the pills in an empty bottle and bring the bottle with me to the office. I've been cutting time close lately so Dunkin' has been breakfast of late, something I need to cut back on. Chocolate donuts, while fun to eat, shouldn't be eaten daily. I don't close the top on the compartment until it's filled again. I'm finding this method is helping me remember. I don't think there is anything wrong with my memory. I just let the negative voice drown out the positive voice. It's also winter and the cold and dark can be oppressive, sapping what little self-caring energy you have. I felt my internal 'ship', if you will, had tilted and was taking on water. This small step will right that ship and get me back on track. It's like the cleaning I've been doing after reading the tidying up book. Things have to be done in small steps. I can do this in small steps.